A full year of lessons and handouts on your computer! 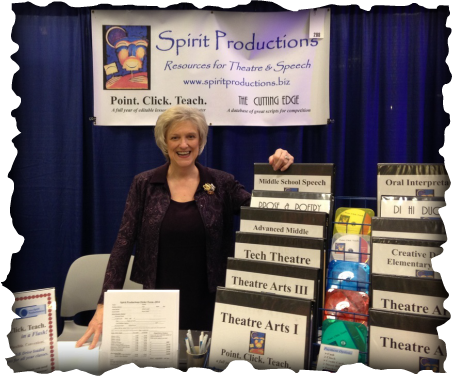 ﻿Curriculum for teaching theatre, speech, and forensics. Full year courses you can download to your computer include editable worksheets, rubrics, handouts, project guidelines, detailed assignment descriptions. Championship scripts and performance tips! Find great scripts, learn how to block your duo or duet, and discover tools to develop characters. Materials prepared by an NFL diamond coach with over 30 National, state, and district champions! Creative process guidelines and practical tips from a championship coach for your individual event. Prepare for contest by working with a state championship director. Get your entire squad prepared for the cost of one student attending an institute. We provide the scripts; you provide the winners. Revitalize your teaching! Dynamic, practical, sessions customized to suit specific needs of your teachers and students.